Think Blogger is playing up again .....Ouch!!!!! Nearly lost my post!!!! I've missed a load of your posts Sylvie so I've been having a catch up and what a fabulous selection of cards. The 'Less is More' ones are exceptionally clever - I really struggle with that theme but would love to master it! This card is just brilliant! Wow - look at you with your second card already! And what a stunner Sylvie! I love the texture you've created on your inked strip. Love this card, snow boarding with the sea in the background, love it Sylvie. 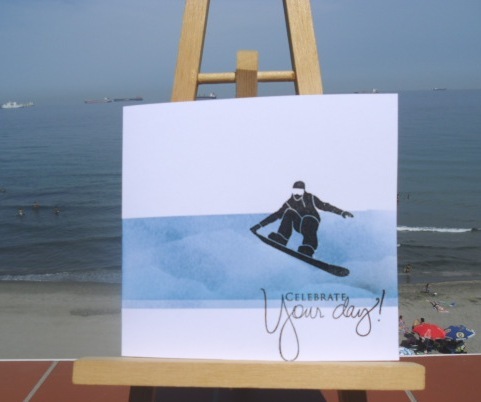 Fabulous card - love the snowboarder dude!! My son would love this! I think the Blogger team must be trying to improve things again - but I'm not having any problems (yet)! This card is brilliant, I love the background. Great action card Sylvie. Perfect for this challenge. Two great cards but I love your first one the most, classy, this one looks more monsterish. Brilliant Sylvie, this is fab. Wow, Sylvie! This is fantastic! I love this card. There are so many things so right about it. Cool card! Love your inked water.